Designed by Podiatric and footwear professionals specifically for studded and cleated footwear. bootmate tsi®'s features and technical functionality means they fit into tight fitting boots to help provide better foot function, reducing the potential for injuries, and providing a comfortable experience. the unique design, combining Insolia Sport and Insolia Flex meets the demands placed on feet in studded and spiked shoes and boots. •	Helps protect the foot from studs and spikes found in boots and athletic shoes. •	Lies flat and does not deform in tight fitting footwear. •	Provides shock absorption and functional arch support. •	Centres the foot for improved function during sport. •	Permits a fuller stride length. •	Permits timely heel lift and improved energy efficiency. 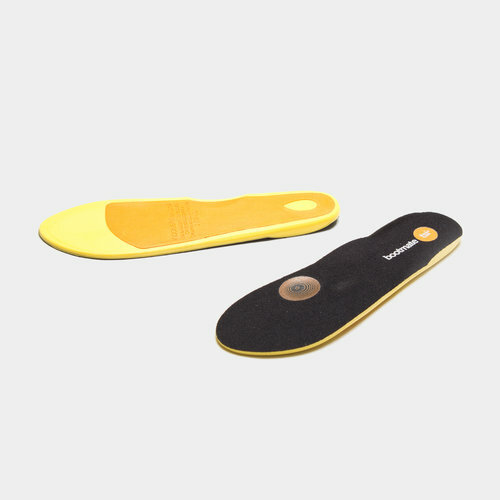 •	Easily replaces stock insoles and liners via ‘trim-to-fit’ guides. Insolia® Flex has been proven to allow natural flexing of the foot and therefore more efficient walking and running whilst in your boots. bootmate tsi® comes in 5 sizes from UK 3.5 (Euro 36) to UK 12 (Euro 47). Can be wiped clean using a damp cloth soaked with warm water and mild soap. Air dry.